Screen Size: 13.3 inch IPS Screen with 1920 x 1080 Resolution vivid and colorful visual enjoyment. 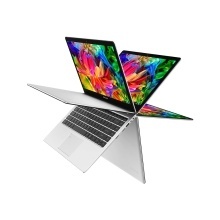 CPU: Intel HD Graphics 615 + Intel Core m3-7Y30 Dual Core 1.0GHz, up to 2.6GHz. Storage: 8GB DDR3 RAM for Advanced Multitasking, 128GB SSD Storage Capacity. Compared with electromechanical drives, SSDs are typically more resistant to physical shock, run silently, have quicker access time and lower latency. Front Camera: 2.0MP, support Face-to-face Chat. Battery: 7.6V / 5000mAh, Li-on polymer battery. OS: Windows 10 smooth and wonderful user experience. Storage Extend The laptop has only one 128GB SSD slot, if you need more storage, PLS change a new SSD with larger storage by yourself. * Item color may show slight aberration due to different shooting light and monitor display.